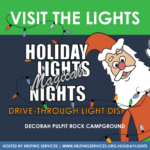 Bring your family and friends and come drive through dozens and dozens of Christmas light displays. Visit Santa, and enjoy some peaceful time together. 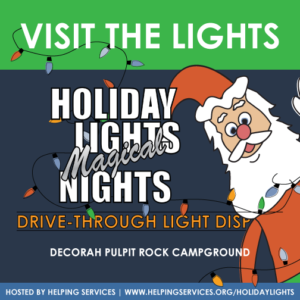 This winter wonderland is made possible by hours of volunteers’ time and generous individual and business sponsorships. Your donation, at the gate or online, will be used to keep services available to end domestic violence and child abuse; build healthy families and relationships; and reinforce positive decision-making about alcohol, tobacco, and other drug use.